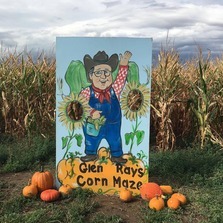 Glen Ray's Corn Maze is a new fall attraction perfect for kids and kids at heart. Activities include a 7 1/2 acre Jack-o-lantern corn maze, 50 ft giant slide, large corn pits, Kiddie Corral with games and activities for kids, small animal farm, giant bale pyramid and The Field of Fright, a haunted corn maze, on weekends at dark. There is definitely something fun for everyone!